The Sydney Opera House, located in Sydney, New South Wales, Australia, is one of the most famous performing arts venues in the world. Designed by Jørn Utzon, a Danish architect, the Sydney Opera House is one of the most distinctive and famous twentieth-century buildings. Opened in 1973, it was designated a UNESCO World Heritage Site as of June 27, 2007. Situated on Bennelong Point in Sydney Harbor, with park land to its south and close to the equally famous Sydney Harbour Bridge, the building and its surroundings form an iconic Australian image. It is also famous for lengthy delays in its completion, huge cost overruns, and a stormy relationship between designer and client which led to Utzon's resignation from the project in 1966 before its completion. As well as many hosting well-known touring theater, ballet, and musical productions, the Opera House is the home of Opera Australia, the Sydney Theater Company and the Sydney Symphony. It is administered by the Opera House Trust, under the New South Wales Ministry of the Arts. The Sydney Opera House is an expressionist modern design, with a series of large precast concrete "shells," each taken from the same hemisphere, forming the roofs of the structure. The Opera House covers 4.5 acres of land and is 605 feet long and about 388 feet wide at its widest point. It is supported by 580 concrete piers sunk up to 82 feet below sea level. Its power supply is equivalent to that of a town of 25,000 people and is distributed by 401 miles of electrical cable. The roofs of the House are covered with 1.056 million Swedish-made tiles, glossy-white and matte-cream in color. The buildings' Concert Hall and Opera Theater are each contained in the two largest groups of shells, and its other theaters are located on the sides of the shell groupings. The form of the shells is chosen to reflect the Opera House's internal height requirements, rising from the low entrance spaces, over the seating areas and up to the high stage towers. A much smaller group of shells is set to one side of the monumental steps to house the Bennelong Restaurant. Although the roof structures of the Sydney Opera House are commonly referred to as shells, in a strictly structural sense they are actually precast-concrete panels supported by concrete ribs. The building's interior is composed of pink granite quarried in Tarana and wood and brush box plywood supplied from northern New South Wales. The Sydney Opera House contains five theaters, five rehearsal studios, two main halls, four restaurants, six bars, and numerous souvenir shops. 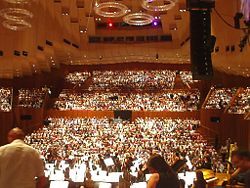 The Concert Hall, with 2,679 seats, contains the Sydney Opera House Grand Organ, the largest, mechanical-tracker-action organ in the world with over 10,000 pipes. The Opera Theater, with 1,547 seats, is the main performance space for Opera Australia; it is also used by the Australian Ballet Company. Besides theatrical productions, venues at the Sydney Opera House are also used for functions such as weddings, parties, and conferences. Planning for the Sydney Opera House began in the late 1940s when Eugene Goossens, the Director of the New South Wales (NSW) State Conservatorium of Music, lobbied for a suitable venue for large theatrical productions. At the time, the normal venue for such productions was the Sydney Town Hall, but it was not considered large enough. By 1954, Goossens succeeded in gaining the support of NSW Premier Joseph Cahill, who called for designs for a dedicated opera house. It was also Goossens who insisted that Bennelong Point be the site for the Opera House. Cahill had wanted it to be on or near the Wynyard Railway Station, located in the north-western Sydney. The competition was launched by Cahill on September 13, 1955 and received a total of 233 entries from 32 countries. The criteria specified a large hall seating 3,000 and a small hall for 1,200 people, each to be designed for different uses including full-scale operas, orchestral and choral concerts, mass meetings, lectures, ballet performances, and other presentations. The basic design announced in 1957 was the one submitted by Jørn Utzon, a Danish architect. Utzon arrived in Sydney in 1957 to help supervise the project. The Fort Macquarie Tram Depot, occupying the site at the time of these plans, was demolished in 1958, and formal construction of the Opera House began in March 1959. The project was built in three stages. Stage I (1959–1963) consisted of building the upper podium. Stage II (1963–1967) saw the construction of the outer shells. Stage III consisted of the interior design and construction (1967–1973). Stage I commenced on December 5, 1958, by the construction firm Civil & Civic. However, major structural issues still plagued the design, and inclement weather further delayed progress. By January 23, 1961, work was running 47 weeks behind. Work on the podium was finally completed on August 31, 1962. The forced early start led to significant later problems, not least of which was the fact that the podium columns were not strong enough to support the roof structure, and had to be re-built. 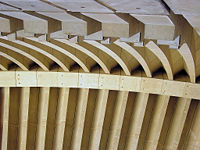 The shells of the competition entry designed were originally of undefined geometry, but early in the design process the "shells" were perceived as a series of parabolas supported by precast-concrete ribs. However, engineers Ove Arup and partners were unable to find an acceptable method of constructing them. From 1957 to 1963, the design team went through at least 12 iterations or repetitions of the form of the shells (including schemes with parabolas, circular ribs, and ellipsoids) before a workable solution was completed. The design work on the shells involved one of the earliest uses of computers in structural analysis in order to understand the complex forces to which the shells would be subjected. In mid-1961, the design team found a solution to the problem: the shells all being created as sections from a sphere. With whom exactly this solution originated has been the subject of some controversy. The shells were constructed by Hornibrook Group Pty Ltd., who were also responsible for construction of the interiors in Stage III. Hornibrook manufactured the 2,400 precast ribs and 4,000 roof panels in an on-site factory, and also developed the construction processes. This solution avoided the need for expensive formwork construction by allowing the use of precast units and allowed the roof tiles to be prefabricated in sheets on the ground, instead of being stuck on individually at height. An Ove Arup and Partners' site engineer supervised the construction of the shells, which used an innovative adjustable steel trussed erection arch to support the different roofs before completion. Stage III, the interiors, started with Utzon moving his entire office to Sydney in February 1963. However, there was a change of government in 1965, and the new administration declared the project under the jurisdiction of the Ministry of Public Works. This ultimately led to Utzon's resignation. The second stage of construction was still in process when Utzon resigned. His position was principally taken over by Peter Hall, who became largely responsible for the interior design. Other persons appointed that same year to replace Utzon were E.H. Farmer as government architect, D.S. Littlemore, and Lionel Todd. Suspended rings called "acoustic clouds" were installed over the Concert Hall's stage in an attempt to deal with sound problems caused by the hall's high ceiling. Cladding to the podium and the paving (the podium was originally not to be clad down to the water, but to be left open). Construction of glass walls (Utzon was planning to use a system of prefabricated plywood mullions, but a different system was designed to deal with the glass). Interior designs: Utzon's plywood corridor designs and his acoustic and seating designs for the interior of both major halls were scrapped completely. 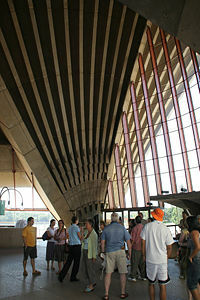 In 1966, following Utzon's resignation, acoustic adviser Lothar Cremer confirmed that Utzon's original acoustic design only allowed for 2,000 seats in the main hall. He further stated that increasing the number of seats to the intended 3,000 would be disastrous for the acoustics. The subsequent Todd, Hall, and Littlemore versions of both major halls have indeed involved some problems with acoustics, particularly for the performing musicians. The orchestra pit in the Opera Theater is cramped and making it difficult for musicians to hear, and the Concert Hall has a very high roof, creating other acoustic problems which have not been entirely solved. The Opera House was formally completed in 1973, having cost $102 million. The original cost estimate in 1957 was $7 million, and the original completion date set by the government was January 26, 1963. The Opera House was formally opened by Queen Elizabeth II, in her capacity as Queen of Australia, on October 20, 1973, which crowds of millions attended. The opening was televised and included fireworks and a performance of Beethoven's Symphony No. 9. Prior to the opening, two performances had already taken place in the finished building. On September 28, 1973, a performance of Sergei Prokofiev's War and Peace was played at the Opera Theater and on September 29, the first public concert in the Concert Hall took place. It was performed by the Sydney Symphony, conducted by Charles Mackerras, with accompanying singer Birgit Nilsson. During the construction of the Opera House, a number of lunchtime performances were arranged for the workers with Paul Robeson, the first artist to perform at the (unfinished) Opera House in 1960. Before the Sydney Opera House competition, Utzon had won seven of the 18 competitions he had entered, but had never seen any of his designs built. Utzon's submitted concept for the Sydney Opera House was almost universally admired and considered groundbreaking. For the first stage of the project Utzon worked successfully with the rest of the design team and the client, but as the project progressed, it became clear that the competition requirements had been inadequate with regard to acoustics, specifications of performance spaces, cost, and other issues. Tensions between the client and the design team grew further when an early start to construction was demanded, despite an incomplete design. The Utzon Room: rebuilt and redecorated to Utzon's original design. Utzon was highly reluctant to respond to questions or criticism from the client's Sydney Opera House Executive Committee (SOHEC). However, Utzon was greatly supported throughout by Professor Harry Ingham Ashworth, a member of the committee and one of the original competition judges. Yet, the relationship was not helped by Utzon, who was unwilling to compromise on some aspects of his designs which the clients wanted to change. Throughout the following years, the relationship between designer and clients only got worse, with Utzon refusing access to drawings and documents by the Minister of Public Works' representative. At the same time, there were also arguments over work carried out and not paid. Utzon left the project on February 28, 1966. To this day, opinion is still split on the roles of the different parties in the project. 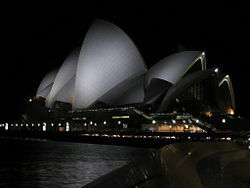 Beginning in the late 1990s, the Sydney Opera House Trust began to communicate with Jørn Utzon in an attempt to effect a reconciliation, and to secure his involvement in future changes to the building. In 1999, he was appointed by the Sydney Opera House Trust as a design consultant for future work. 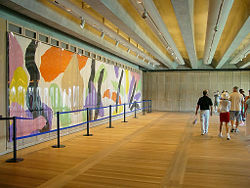 In 2004, the first interior space rebuilt to match Utzon's original design was opened, and renamed "The Utzon Room" in his honor. ↑ To bond a metal to (another metal), especially to provide with a protective coat. Flyvbjerg, Bent. "Design by Deception: The Politics of Megaproject Approval," Harvard Design Magazine, Volume 22, 2005.. flyvbjerg.plan.aau.dk. Retrieved September 7, 2007. Stuber, Fritz. 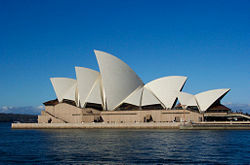 "Sydney's Opera House - Not a World Heritage Item? - Open letter to the Hon. John W. Howard, Prime Minister" In: Australian Planner (Sydney) Vol. 35, No. 3, 1998; Architecture + Design (New Dehli), Vol. XV, No. 5, 1998 collage (Berne), No. 3, 1998. 33-34, 1 ill. The Sydney Opera House mapygon – www.mapygon.com. The Sydney Opera House official website – www.sydneyoperahouse.com. SAW - architect led tours of Utzon's House – www.sydneyarchitecture.org. Sydney Opera House – en.structurae.de. History of "Sydney Opera House"
This page was last modified on 9 November 2015, at 15:31.